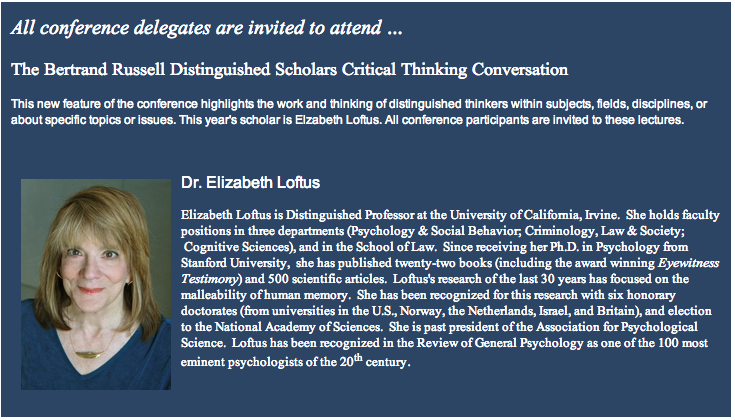 At last year’s conference we introduced the Bertrand Russell Distinguished Scholars Critical Thinking Conversations. This new feature of the conference highlights the work and thinking of distinguished thinkers within subjects, fields, disciplines, or about specific topics or issues. We honor the thinking, the philosophy and the contribution of Bertrand Russell through these conversations. Russell, B. (1956). Portraits From Memory and Other Essays . New York: Simon and Schuster. Russell, B. (1957). Why I am Not a Christian . New York: Simon and Schuster.